The colorized update of Balloon Kid, called Balloon Fight GB, floated onto the Japanese 3DS eShop a few days ago (on Oct. 19, to be exact). For those of you who've never heard of it, Balloon Fight GB was released in 2000--ten years after Balloon Kid was released in North America--via Nintendo's Japan-only Nintendo Power service. 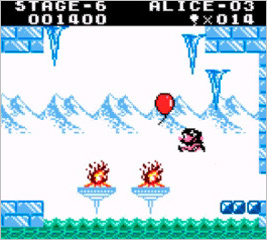 Balloon Fight GB is more than just Balloon Kid in color, by the way; it also added a map screen and Super Game Boy features and allowed players to save their progress. Anyway, here's hoping Nintendo of America does the intelligent thing and releases Balloon Fight GB--and not the black-and-white (or black-and-green) original--on the North American eShop sooner rather than later. I must get this game! Thanks for the info! Yes, go get it! I think you'll really like it :) Oh, and let me know what you think of it after you actually play it, OK? Yes, keep 'em crossed! And if for some dumb reason NOA refuses to give it to us, hunt down the ROM and give it a go via emulation. It really is a fabulous little game.